For most students in the Northern Hemisphere, the summer break has arrived. We heartily recommend enjoying some relaxation in a hammock during the long, hot days of summer. But don’t forget to take some reading material with you to the beach, the mountains, the backyard, or wherever summer vacation takes you. With that in mind, we’ve released the May 2014 issue of RocketSTEM magazine. 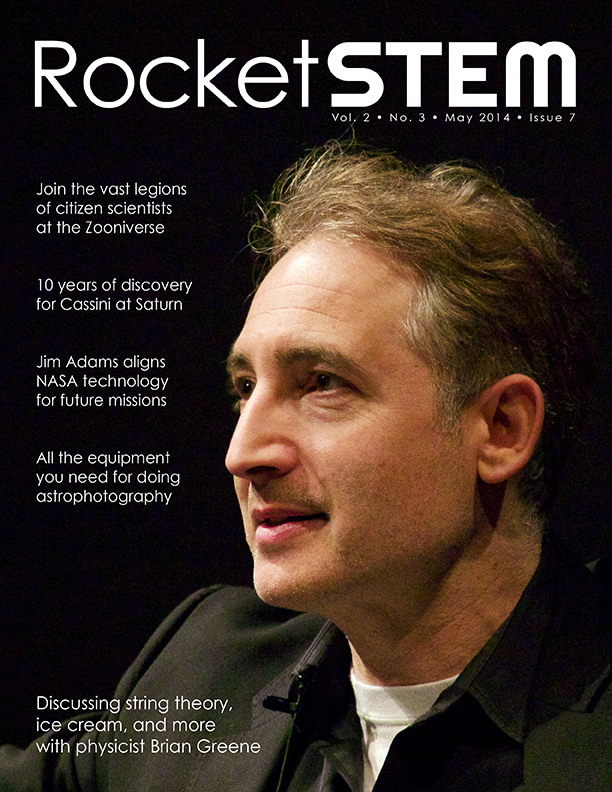 Our cover feature is an interview with famed theoretical physicist Dr. Brian Greene. For those wanting to extend their learning into the summer months, we recommend checking out World Science U, and its free online classes taught by Greene himself. For those wanting to participate in science directly, we’ve got an overview on the Zooniverse, which has surpassed more than one million citizen scientists analyzing images and helping with real ongoing research. Planning on doing some stargazing this summer? We’ve got a guide to getting started in astrophotography, as well as a number of stories on recent discoveries of planets, moons and other celestial objects. We also celebrate the Cassini spacecraft, which has spent a decade orbiting and exploring Saturn, its stunning rings and dozens of moons. In a bonus interview feature, we speak with NASA’s Jim Adams and learn the responsibilities of the agency’s Office of the Chief Technologist, as well as his thoughts on manned vs. unmanned exploration of space. All this, and more, in the latest issue of RocketSTEM! The famed theoretical physicist, author and string theorist educates us on a variety of topics. Ready to photograph the stars? We give you a rundown on the equipment you need. A decade of discovery and images while orbiting Saturn, its rings and 62 moons. During his career at NASA, Adams has been involved with dozens of missions. More than one million regular people are contributing to a multitude of science projects. Doing the math on Boeing’s alternate plan for taking humans to the Moon.